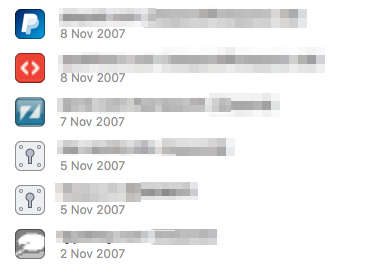 A couple of days ago I was cleaning up my 1Password primary vault, and I came across some of entries dated 2008. 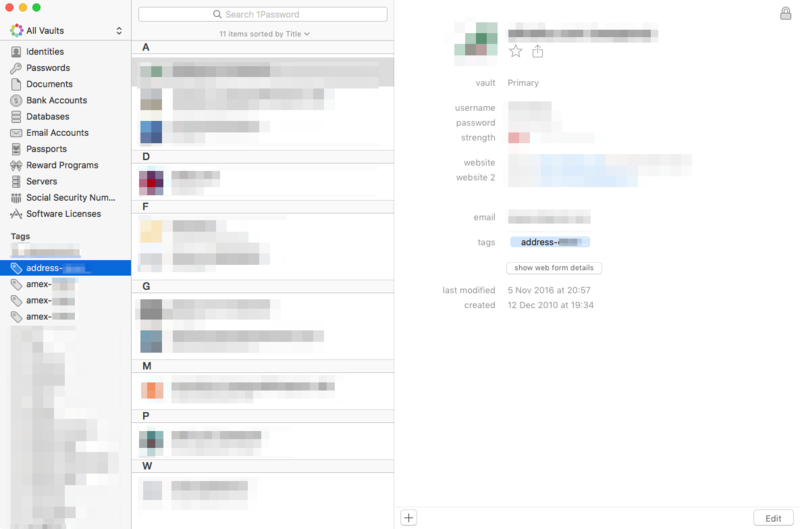 In the software industry, 8 years it's quite a long period for a software adoption, and a question popped into my head: how long have I been using 1Password for? It turns out the answer is 9 years, as the oldest entry I have in my vault was created exactly 9 years ago, on November 2nd 2007. I'm a huge fan of 1Password: in these 9 years I purchased a new license each time I was asked to upgrade, I purchased separate licenses for all my Apple devices such as iPhone, iPad and Mac, and I even purchased a Windows licence back in the days I was still synchronizing some entries with some old virtual machine, when they released their first Windows version. 1password was one of the first product to bet on cloud sync, and their Dropbox sync was one of the best feature they could ever possibly introduce, second only to the core product itself. If I should name 5 softwares I could not use a device without, 1Password would be on the list, second only to a terminal (such as iTerm). I could spend hours telling you how awesome 1Password is, but I won't. Instead, I'd like to share with you a few tips that I used these years to adopt 1Password to my daily business and personal needs. For someone with a very intense online presence like me, physically moving your furnitures and clothes from one apartment to another is not always the most painful task of changing address. It certainly is, but it's quite easy to accomplish and very easy to check: when the previous apartment is empty, you're done. Instead, tracing all the places where you added your address in the past is challenging and it may happen that you buy a new TV on Amazon with the 1click Prime feature, you forget to update the address, and the TV is delivered to the old address (true story). Here's where the tags are very helpful. I have tags for each of my credit cards, address or settings that are critical and I want to keep track of. When a credit card expires, I can easily click on a tag to determine where it was used, and which accounts I have to update. And because you can also save notes and othee documents in 1Password, you can always tag any offline item you want to keep track of. I'm a frequent traveller. In the last 3 years I visited more than 10 countries, flew over 100 trips and lost the count of the number of times I had to use my passport. Luckily, so far, nothing bad happened. However, I heard stories from friends who got robbed, or lost their passports while on holiday. If it happened to them, there is a chance that at some point it may happen to me too. 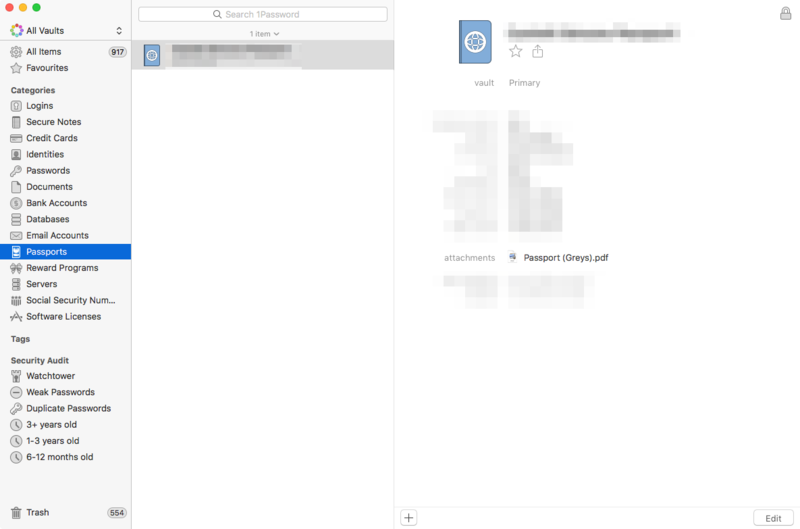 I have a copy of each document in encrypted vaults, but I also keep a copy of most important travel documents encrypted in 1Password. They are generally lower quality copies, useful in case of emergency. Likewise, I have important numbers stored as entries in 1Password. One of 1Password killer feature (at least to me) is the ability of attach arbitrary documents to items. They also have a specific Passport items, which is really helpful to store the details of your passports as well with a digital copy of it to use in case of emergency. Ability to use notes to store sensitive files that needs to be backup, such as private/public key pairs (I'd love to have a specify entry type for that), TLS/SSL certificates, recovery codes, etc. Ability to use the "duplicate password" feature to audit your passwords and determine, in case of breach, which other services may be compromised and have to be immediately updated. I know, you should not use duplicate passwords, but unfortunately passwords exist way before 1Password was created, and I did not trust my brain enough 10 years ago to generate a different password for each service (although I used some nice trick to ensure there was at least a bit of entropy between most of them). I love 1Password, because it's not just a simple password manager. Being able to securely store and sync your password is a feature that several tools provide today, including browsers and operating systems (Apple does sync passwords across devices via iCloud). However, 1Password is much more than a simple password manager, and I encourage you to explore (and share) ways to stay secure while simplifying your daily online presence management.